Unusual and exceptional are two appropriate descriptions of this concert. The musicians concerned were two Russian string players who have impressive records of performance in their home country and more recently over here. Yuri Zhislin was the BBC2 Young Musician of the Year in 1993 and has been studying and working in the UK for many years, being recognised as one of the most versatile violinists of his generation. Natalia Lomeiko has an equally impressive record of achievement and performance and is currently a Professor of Violin at The Royal College of Music. The concert was an excellent opportunity to hear a series of violin/viola duos that presented a memorable programme and musical experience for the audience. 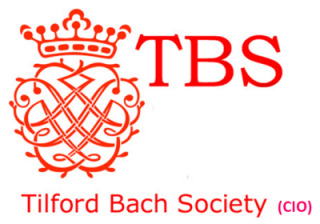 Any apprehension that this might be a monotonous succession of string duos was misplaced as the works were quite varied and the virtuosity of the players astonished the audience. Their timing and synchronicity were perfect. As a married couple they obviously have plenty of opportunity to practise together. Starting with the baroque composer Bruni, less renowned than his contemporary Mozart, moving through a series of adapted two-part inventions by JS Bach into a famous duo by Mozart (K423), that helped put the viola to the fore as an instrument, the programme finished with the dissonance of Prokoviev in a Sonata for Two Violins. Except it didn’t finish there as the encore was a stunning Passacaglia by Halvorsen based on music by Handel – the speed and intensity of this piece had some members of the audience trying to spot the location of the fire extinguishers in case the instruments burst into flame. 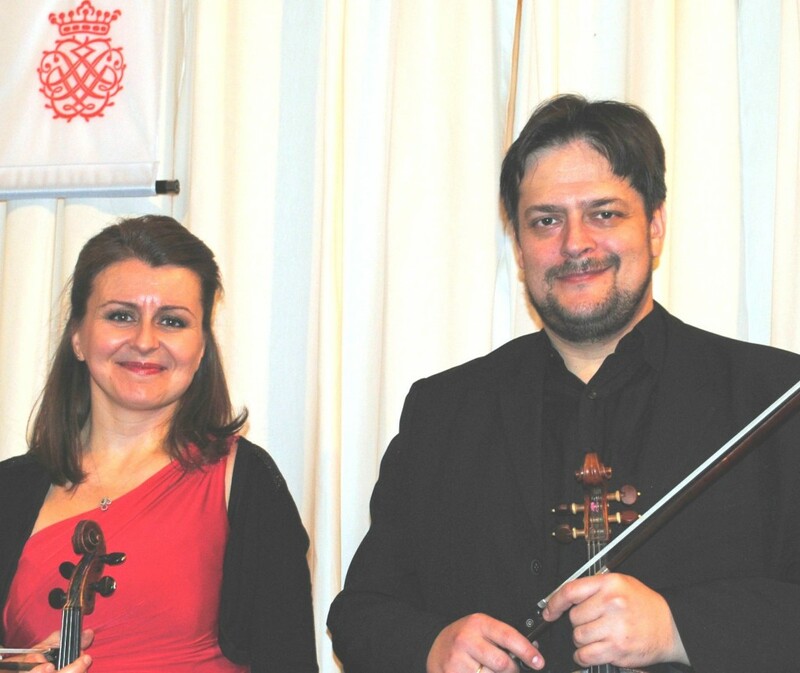 The Lomeiko – Zhislin Duo is an artistic union created as a result of their strong desire to be together on stage, as well as in life. Wonderful musicians in their own right; among numerous awards Natalia is a Gold medal prize – winner of the “Premio Paganini” international violin competition and Yuri is the BBC Radio Two Young Musician. Both are also professors at the Royal College of Music. The Lomeiko-Zhislin Duo is rapidly becoming an invaluable asset at Chamber Music Festivals around the globe being praised for their superb ensemble and musicianship qualities. Together they have performed with the Moscow State Chamber orchestra, the Belgrade Philharmonic, the Pacific Symphony, the Queensland Symphony, the Christchurch Symphony, the Kurashiki String Academy, the London Soloists, the Emerald Enemble, the English Soloists Ensemble, the New European Strings, the Yerevan Philharmonic orchestras and with the Russian Virtuosi of Europe – a chamber orchestra of which they are founder members. 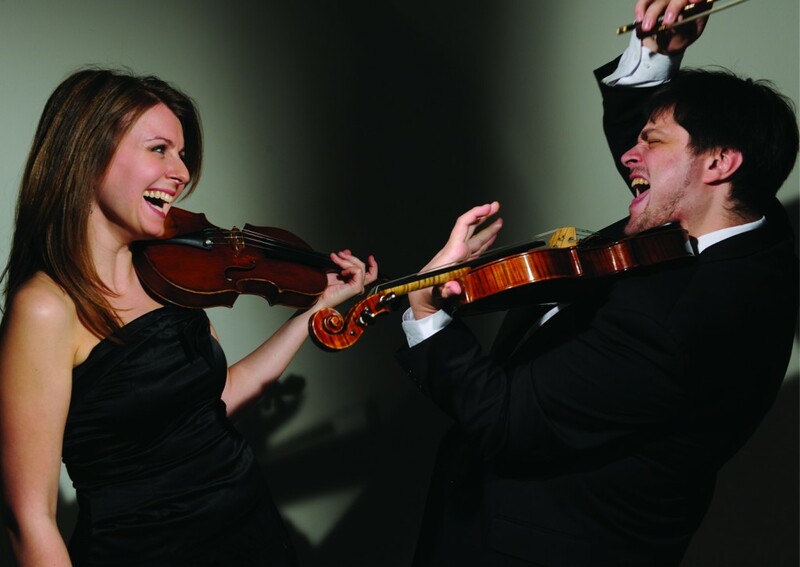 Their Duo recital programmes have been enthusiastically received at the Wigmore Hall, the Ako Festival in Japan, Burton and Bradstock Festival and Lincolnshire Festivals in England, and concert venues across Europe. Natalia and Yuri’s joint CD for Naxos was released in 2011 and features complete violin and viola works by A. Bruni and J. Halvorsen. 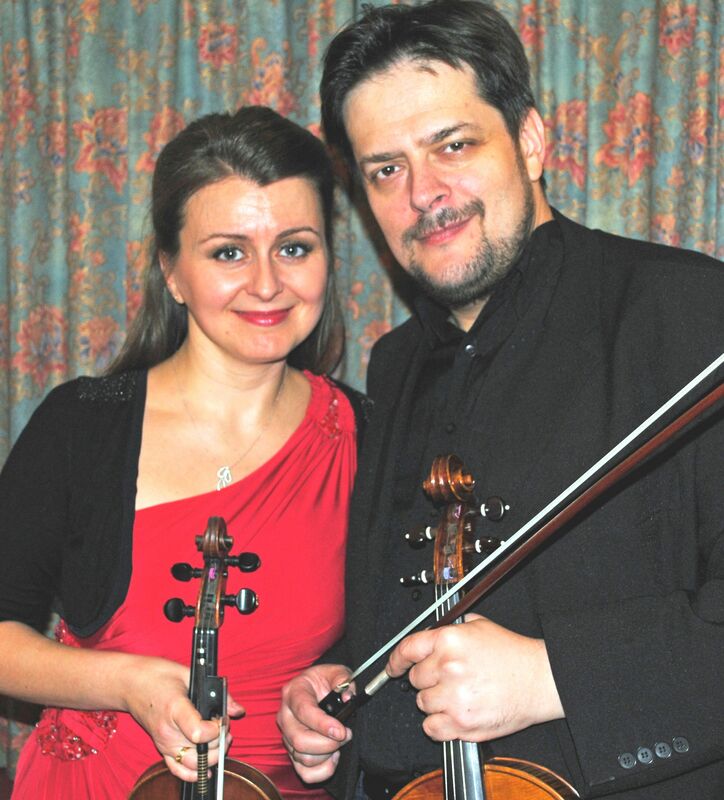 “The highlight of the evening was the performance by the Lomeiko-Zhislin Duo. The Mozart’s Sinfonia Concertante is often played these days, and the listeners are offered a wide variety of different interpretations. Lomeiko and Zhislin, however, gave us one of the best versions I have ever heard. They played this beautiful music effortlessly and naturally, not making anything up, following the great composer’s ideas: light, happiness, nobility and wisdom..
Natalia Lomeiko was born into a family of musicians in Novosibirsk, Russia, Natalia has won numerous prizes including the Menuhin and International Violin competitions, and in 2000 she received the Gold Medal and the 1st Prize in the Premio Paganini International Violin Competition (Genoa, Italy) and the 1st prize in the Michael Hill International Violin Competition (Auckland, New Zealand) in 2003. Natalia studied at the Specialist Music School in Novosibirsk with Prof Gvozdev, at the Yehudi Menuhin School with Lord Menuhin and Prof Boyarskaya, at the Royal College of Music and the Royal Academy of Music. Since her debut with the Novosibirsk Symphony Orchestra at the age of seven, Natalia has performed as a soloist with many orchestras, such as the Royal Philharmonic Orchestra under the baton of Lord Menuhin, the Philharmonia, the Moscow State Chamber Orchestra, and the Russian State Philharmonic Orchestra. Natalia has recorded several CDs inlcuding Three Grieg Violin Sonatas with pianist Olga Sitkovetsky, French Sonatas with Olga Sitkovetsky (described by the Strad as “… a stunning recital”). Her latest CD of Prokofiev’s music received 5 star reviews. Her CD of Bruni and Halvorsen with her husband Yuri Zhislin is what led to this evening’s performance. She is Professor of Violin at the Royal College of Music in London since 2010. Yuri Zhislin was born in 1974 into the musical family of well-known Russian violinist Grigori Zhislin. He studied in his native Moscow and later at the Royal College of Music in London. In 1993, Yuri became the BBC Radio 2 Young Musician of the Year. In 1994, he won the Malcolm Sargent Award. He has given recitals and performed in concerts with numerous orchestras in London and throughout Europe, the USA, South America, Japan, Australia and New Zealand. In high demand as a chamber musician, Yuri regularly appears both on the violin and the viola at festivals around the world. His chamber music partners have included Maria Joao Pires, Dmitry Sitkovetsky, Michael Collins, Natalie Clein, Chloe Hanslip and Ashley Wass. He is the founder and Artistic Director of the Russian Virtuosi of Europe, an ensemble that brings together some of the finest young Russian musicians based in Western Europe. He is professor of violin and viola at the Royal College of Music and gives masterclasses in Bulgaria, Spain, Holland, Sweden and Japan. Yuri’s interests include non-classical music. He has recorded with Vanessa-Mae, appeared on Top of the Pops and the Pepsi Chart Show with Sash!, performed at the Nick Cave’s Meltdown Festival and recorded with distinguished jazz musicians.